In the Sixties, Sebastiano Pala immigrated to the Marche region of Italy from Sardinia. The only things he brought with him were his experience and a herd of sheep. Giuseppe Pala and his brother Luca and Marco represent the second generation of their family on this farm. Luca produces the cheese in the family dairy in Tavoleto, while Giuseppe ages them at Mercatino Conca. Giuseppe welcomes us busily, still in his work clothes. His clear eyes reveal little of his origins, unlike his authentic love for the animals he raises and for the natural landscapes that surround his farm – which very much resemble his home in Sardegna. He speaks with evident joy about his Sardinian sheep that his father brought here to Tavoleto in the Pesaro province over 40 years ago. They produce a rich and generous milk. His happy animals are destined to enjoy green pastures from a healthy earth. 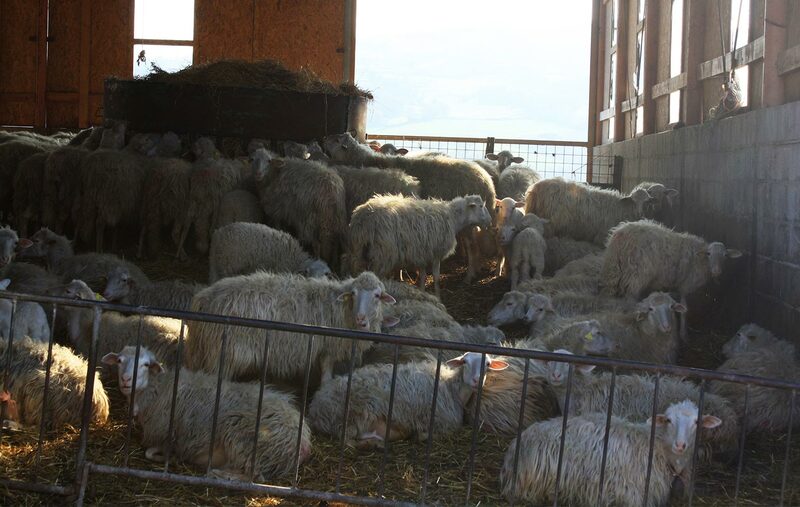 The Pala family raises their livestock using rigorous homeopathy methods to avoid using antibiotics or medicines for the sheep. 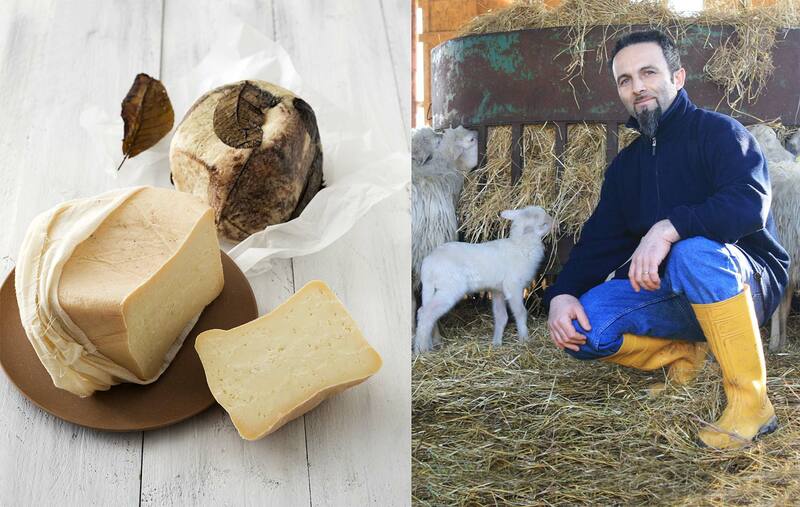 This same, attentive care is behind his incredible cheese “l’Infossato,” which goes above and beyond the DOP certification criteria for a pit cheese, called Formaggio di Fossa in Italy. Standard DOP certifications allow the use of milk from a relatively large territory, but Giuseppe cannot accept the idea of using milk from animals other than his own. The Infossato Case Ventena, full of the scents and flavors of the pasture, has what may be called its very own cru: it comes exclusively from raw milk of the family’s sheep. After three months of maturing, the cheese is wrapped in linen and cotton and rests for 90 days in a hole dug out of the tuff earth with no contact from other producers’ cheeses. After another three months, it is dug up like a treasure, round and beautifully amber in color, with aromas of undergrowth. It is a soft cheese with a strong flavor, a hint of sour and a pinch of spice, with the scent of seasoned hay. For such motivated people like the Pala brothers, even the precise production of Infossato cheese is not enough for them. They make barrel-aged cheeses, too, first aging the white cheese rounds in walnut leaves and grape must for 3 months, then a further 45 days of aging in the barrel. They are never tempted by the siren call of industry with its promises of huge profits for huge quantities. That would go against their religion, against their own cult of naturally aging pasture cheeses from pure, healthy milk. They did not even change their minds after the heavy blow of 2012, when an intense snowstorm destroyed the work and family sacrifices of over 40 years, collapsing structures and killing some of the livestock in just few, brutal hours. The memory still hurts Giuseppe as he shows us his remaining animals, guiding us towards a farm that is still under construction in certain points. As the sun sets, the father Sebastiano returns. He is the very image of a shepherd, with bundles of sticks and monstrous white dogs at his heels. The lines on his face mark a man who has known two storms: the physical snowstorm of 2012, and the emotional tempest of emigration years before. He left Sardinia in 1969 with just his herd of sheep to come and work this land abandoned by its own people, who had emigrated themselves in search of fortune in the Riviera. Our meeting with the Pala men left us impressed with their strong display of passion, hope for the future, and a great capacity for stitching back together the tatters of the past. The farm is coming back to life, and Matteo, Giuseppe’s son, is specializing in agriculture so that he may return to his home where he grew up and continue the tradition. Giuseppe offers us a taste of the Infossato cheese with a proud and happy smile. He has good reason for his joy, and we are left entirely satisfied. As the sun sets, the father Sebastiano returns. He is the very image of a shepherd, with bundles of sticks and monstrous white dogs at his heels. The lines on his face mark a man who has known two storms: the physical snowstorm of 2012, and the emotional tempest of emigration years before. He left Sardinia in 1964 with just his herd of sheep to come and work this land abandoned by its own people, who had emigrated themselves in search of fortune in the Riviera.